If you're anything like me, you probably have hundreds—if not thousands—of photos on your phone. Getting those photos off your phone isn't always entirely obvious, but you have a number of options at your disposal. The traditional approach to getting stuff off your phone is to plug it into your computer using a USB cable. On Windows: Windows treats Android phones like any other camera, so when you plug your phone into your computer, Windows will ask you what to do, just as it would if you plugged in your digital camera. You can peruse the actual files in Windows Explorer, have Windows Explorer import all the photos for you, or use another program to import the photos, like the Windows 8 Photo Viewer app. On OS X: If you've got a Mac, getting photos off your Android phone requires Google's free Android File Transfer app, a very basic file browser app that runs on Mac OS X 10.5 or later, and works with Android phones and tablets running Android 3.0 Honeycomb or later. Once you install the app, it will automatically open whenever you attach an Android phone or tablet to your computer. 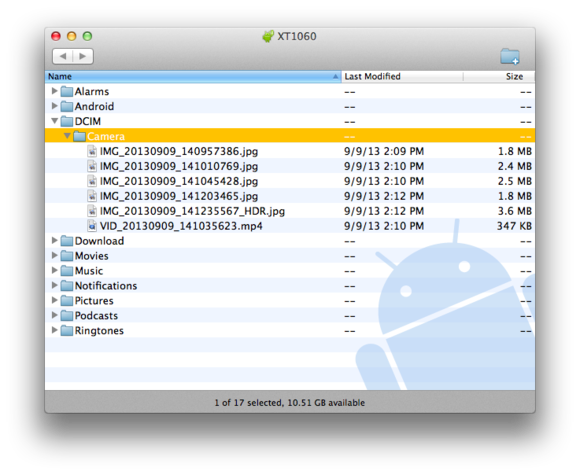 Mac users need to rely on the Android File Transfer app. Your photos will be in one of two areas: The Pictures folder or the DCIM folder. Photos you took with your phone will likely be in your DCIM folder, while other photos or images (like screenshots) you keep on your phone will likely be in the Pictures folder. To save photos you took with your phone's camera, double-click the DCIM folder. You may see another folder within that named "Camera." Open this folder, and you should be able to get at your photos. Sometimes, it's just easier to email yourself. 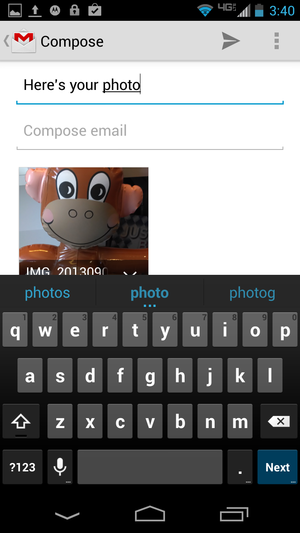 Android makes it easy to email photos to yourself. It's not really an ideal option if you have more than a few photos you want to move off your phone, but it's there if you need it. Open the Gallery app, and navigate to the album containing the photo (or photos) you want to share. Tap the three dots in the upper right corner, and then tap Select Item from the menu that appears. Select the photos you want to send to your computer, then tap the email button in the toolbar at the top of the screen—it looks like an envelope with a card sticking out of it. If the email button doesn't appear in the toolbar, tap the share button—it looks like a sideways V—and select Gmail from the menu. You'll get a "compose" window where you can enter your email address then send your images to yourself. The Gallery app also lets you upload your photos to your Google Drive, so you can get at them from anywhere. If you install the Google Drive app on your Mac or PC, you can have your photos and other files automatically sync to your computer. 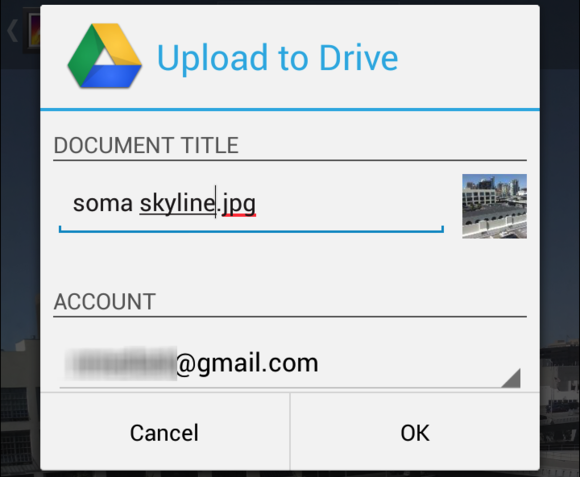 Upload your photos to Google Drive and get at them from anywhere. To upload them to Google Drive, select the photos you want to upload, then tap the share button. From the menu, tap "See all," then select Drive from the list. It'll ask you to give the photo a title and to confirm which account you want to upload to, and where you want to put it on your drive. If it all looks fine, tap OK, and it will go ahead and upload your photos. Once you install the Dropbox app on your phone, you can add photos to your Dropbox from within the Gallery app. Dropbox is another good option for getting photos off of your phone: Install the Dropbox client on all your computers and devices, and it will sync files in your Dropbox to everything. You can pick and choose the photos you want to upload by installing the free Dropbox app for Android, which is useful if you want to pick and choose which photos you want to get off your phone. Once you install the Dropbox app, you can upload your photos to Dropbox directly from Android's Gallery app. To do so, select the photos you want to upload, tap the sideways-V-shaped share button, tap "See all" from the menu, then tap Add to Dropbox. From there, you can choose where on your Dropbox you want to stick your photos. Once you're ready to upload your photos, tap Add, and Dropbox will work its magic. Your photos should then appear on all your devices with Dropbox installed. Camera Upload, another Dropbox feature, lets you automatically upload your photos from your phone directly to Dropbox, so you don't have to individually select then upload them. You can choose to turn this feature on when you first install the Dropbox app on your phone, or from the Dropbox app's settings (tap the three dots in the upper right corner in the Dropbox app, then select Settings from the menu). Dropbox is arguably the most ubiquitous online storage and syncing service out there, but it's hardly the only one. Other options include Box.net, Amazon Cloud Drive, and Microsoft SkyDrive. 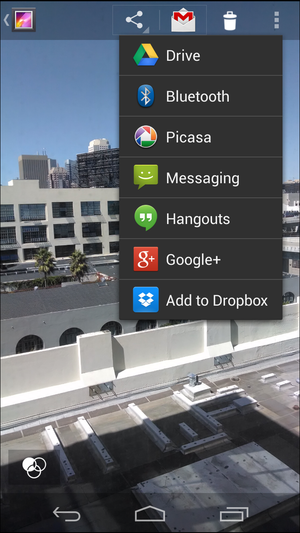 All of these apps do the same basic thing, though each app works a little differently. 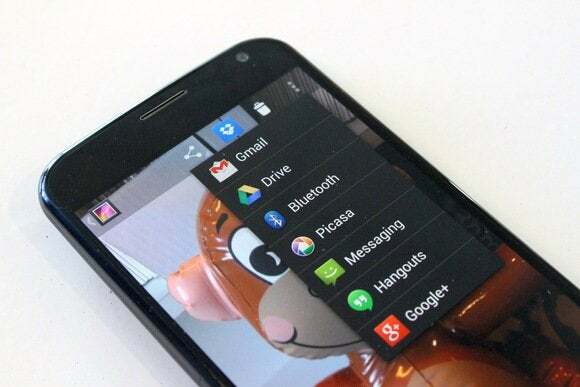 This story, "How to get photos off of your Android phone " was originally published by TechHive.